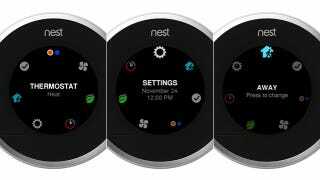 It's been a while since we heard anything new about Nest's flagship product, the quiet elder brother to the attention-hogging Protect. But today the company is pushing a new software update to all existing devices this week, and it's using a clever new bit of software to make them far more efficient. The update includes a few new things, like a new design for its Quick View screen, where users will be able to see information like the weather and temperature outside, as well as metrics like humidity inside. That's all well and good, but what's really interesting is the overhauled Auto-Schedule feature—the part of your Nest that does all the "learning" to make your systems more efficient. In a white paper study published today (PDF), Nest explained one of the major pitfalls of learning thermostats. Paradoxically, users hate losing control, even though they claim to want devices that control things for them. "Making users fight against temperature schedules they did not select or want caused not only irritation and discomfort but also thermostat usage that resulted in higher energy usage than before," says Nest. "By nature, people don't like being told what to do." That's why Nest won't set a temperature that you've set for yourself in the past, and why the schedule adapts over time. The idea is smooth out every possible wrinkle in interaction with the device, and in doing so streamline your energy usage. The new algorithm improves on the idea by using every interaction you have with the device as useful data about your schedule. Even when you don't interact, it creates a data point that indicates you're comfortable. And in general, it adapts more often, based on a broader range of ways in which you change your settings. Rather than learning your schedule within your first few weeks and then asking you to adjust your settings if your schedule changes, the algorithm looks at your recent history and updates itself accordingly. Small software tweaks, yes, but important ones. Consider a few stats: Right now, your auto-schedule and auto-away features give you roughly 20 percent savings for cooling and 16 percent savings for heating. The new algorithm bumps up each number by 6.1 and 5.9 percent respectively. When you're spending hundreds of dollars a month on either, that's a considerable amount of money. Luckily, you won't need to pay a thing for the update—it's rolling out across devices over the next week.